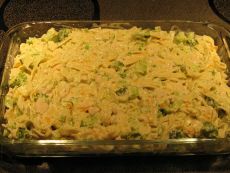 Eat in an hour with this easy chicken casserole recipe! 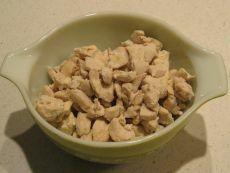 Cut chicken and boil if not using leftovers. 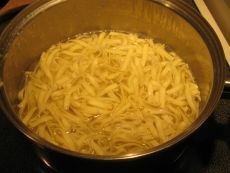 I save the water and boil the noodles in the already hot water! 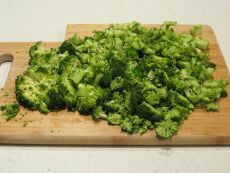 While the noodles are cooking you can be cutting the broccoli into bite-sized pieces. In a medium bowl mix together mayonnaise, eggs, undiluted soup, pepper, and cheese. Stir in chicken, broccoli, and noodles. Pour into a 9/13-inch baking dish. 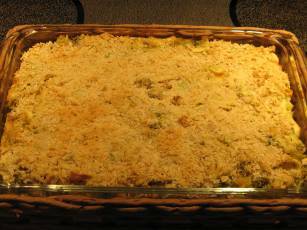 Top with cracker crumbs and bake in a 350-degree oven for 35 minutes or until top is golden brown and casserole is hot and bubbly.